Posted on 1st January 2015 in "Times Square"
The WJAD studio, that is. This is an 8 x 10″ print with no border, with the little handwritten identification number 69-34A-4 added to the print in the lower right-hand corner. It was shot during the filming of the “Your Daughter Is One” performance, but doesn’t come close enough to any shot from the film to even try to find a similar image. 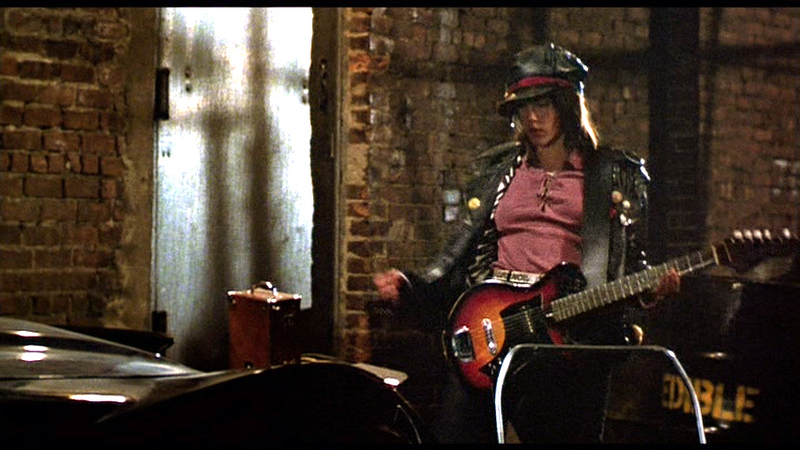 At no point in the film does Nicky turn to her left and smile; she spends the entire scene facing the microphone. This photo will appear again at least once, in the American press kit folder. That version is smaller, to allow for a border, and is cropped at the top and bottom, but shows a tiny bit more along the left edge. It has the same number, but it’s rewritten in a slightly different format, because the one that appears here is cropped out. I don’t know for sure that this one predates that one, but I have to make some kind of decision of what order to put these in. This series are all photos that don’t have “Times Square” printed on them. Not on the front, anyway. This object has handwritten on the back in black ink, “Robin Johnson / ‘TIMES SQUARE'” at the top, and “Times Square” in yellow ink at the bottom. Those were probably added by memorabilia dealers or previous owners. 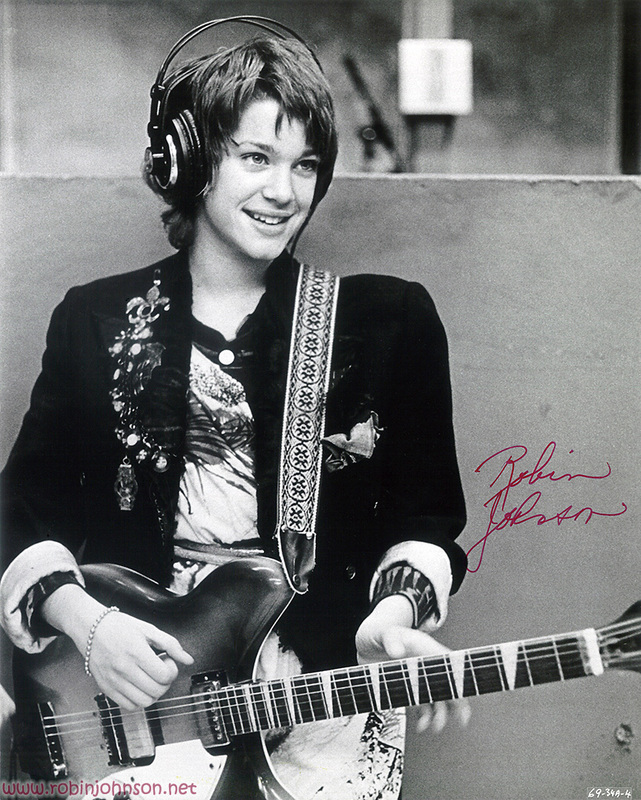 You’ve probably noticed that it’s also signed on the front by Robin… yes, that’s really her signature. No, I’ve never met her. That’s an autograph from back in the day. This item came from England, so it was probably signed during her publicity tour for Times Square in January 1981. Should I have waited to post this until I get to the stuff from her trip to England? Too late, here it is. 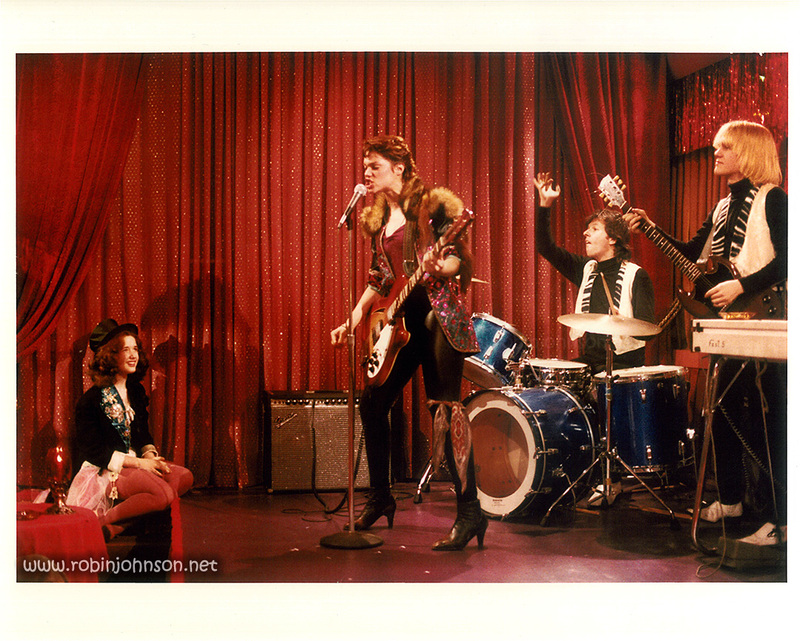 Posted on 24th December 2014 in "Times Square"
Back to the 8 x 10 Kodak prints… here’s another shot of Robin as Nicky dressed up as Aggie playing “Damn Dog” in the Cleo Club, and as always, there’s no frame in the film that matches up. The frame I’ve chosen is the only one where Robin has both hands on her guitar, is singing into the mic, and most importantly Artie has his hand up spinning his drum stick. But, not only is the shot framed entirely differently and from a different position, Robin isn’t even facing the same direction, and may not be singing the same word. “Aggie Doon.” In the commentary audio track on the 2000 Anchor Bay DVD, Robin asks director Allan Moyle why they went with that name, and he doesn’t remember. I seem to remember hearing something about Nicky using a pseudonym because, after all, she’s wanted by the police, but I don’t remember where it was I came across that idea. That doesn’t really make sense, though, since Pammy is dancing under her own real name. The screenplay doesn’t explain it either. Also on the commentary track, in the previous scene where Nicky reads her poem to Pammy, Moyle claims that Robin wrote part of it, and she’s gobsmacked because although she was writing and performing poetry at the time of the commentary’s recording, she has no recollection of contributing to “Damn Dog.” The reason for that is simple: she didn’t. 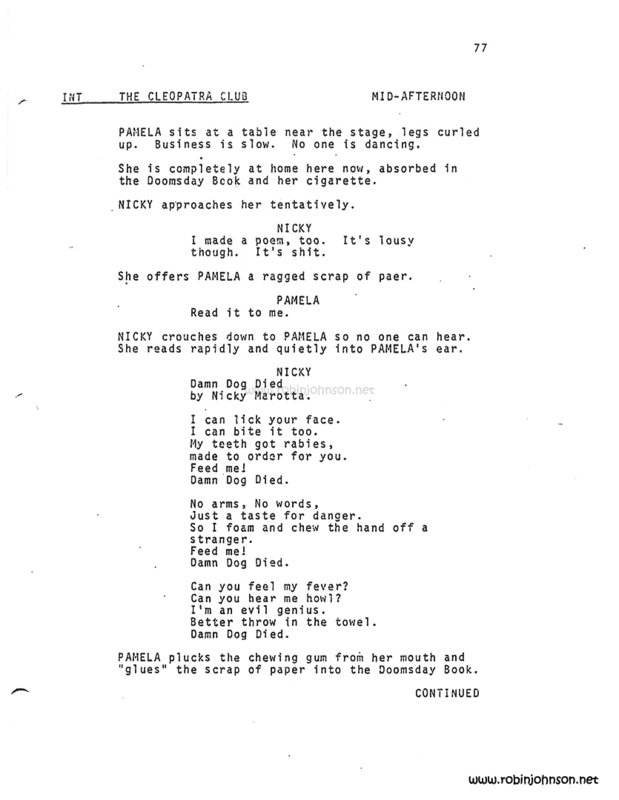 The poem she recites in the film is almost word-for-word the poem Jacob Brackman wrote in the early draft of the screenplay, months before she was discovered; and unless she changed her name to Norman Ross, she didn’t contribute any of the changes made when it was turned into the song. What’s my point? I guess it’s that Allan Moyle, bless ‘im, is something of an unreliable narrator when it comes to the making of Times Square. More importantly, though… if Robin isn’t Norman Ross, then who is? 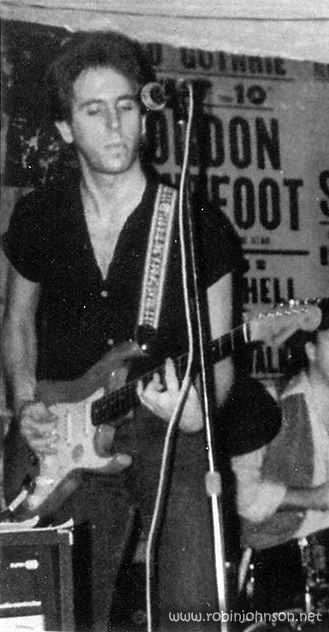 “Norman was one of my closest friends and was the backbone of my band for many years – a stellar guitarist. He was the soul of rock’n’roll incarnate. He died a number of years ago due to a lifetime of wretched excess. If you’re here reading this odds are the chords that kick off “Damn Dog” are burned permanently into your brain. 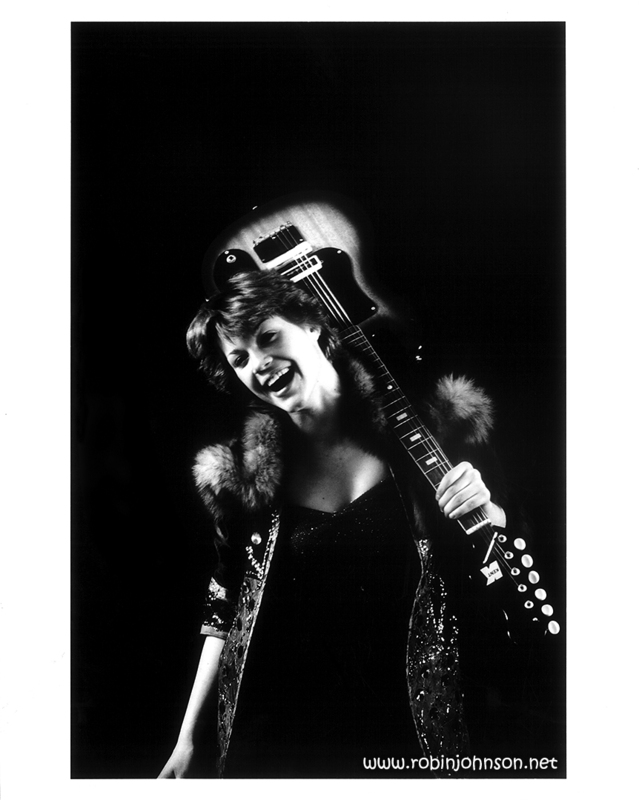 If you play guitar you’ve had a bash at them more than once. They mean something to you in a visceral way. Can you imagine “Damn Dog” without that lick? Can you imagine “Times Square” without a song featuring that lick? Norman Ross created this specific thing without which the effect and the affect of the movie would have been immeasurably diminished. There’d be something missing from your life and you’d never know it. It’s a shame he’s not around so we could express our appreciation directly, but at least we can now keep his name alive whenever we hear “Damn Dog” start up. I dedicate this to Norman Ross, and all the other dinosaurs that got kicked outta the band. Posted on 8th December 2014 in "Times Square"
You know how I’ve been saying the pictures are from alternate takes that don’t actually appear in the film? This one doubles that. Triples. First, there’s no background. This is one of the very few shots taken only for publicity and not at a recognizable shooting location. 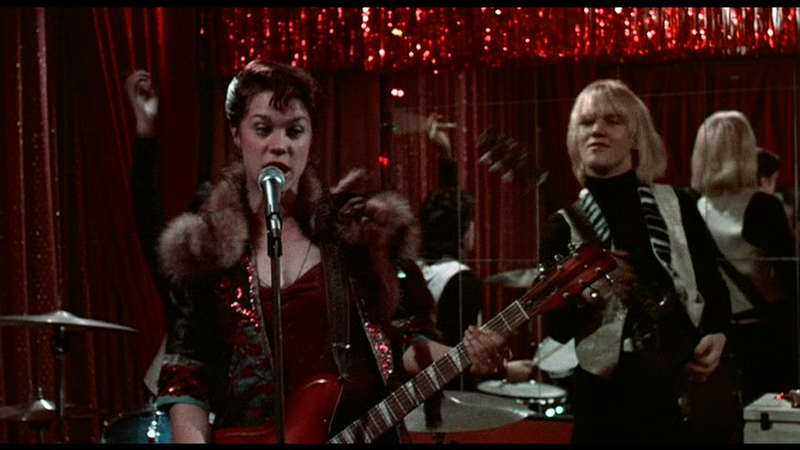 Robin is wearing the Aggie Doon costume, so she’s dressed for the world premiere of “Damn Dog” at the Cleo Club, but she’s carrying her cheap Kent that she lost when she was arrested in the opening scene, and not the expensive Rickenbacker she plays with the Blondells. Also, her hair isn’t slicked back like Elvis like it is in the film. This is a glamor shot of Nicky, nothing more, nothing less. The back of this photo has crop measurement marks indicating the actual size of the picture. My guess is that was to help in laying out whatever page someone may have been planning to print it on, but I don’t really know. I’ve lightened all hell out of this dark alley to try to see the guitar better.